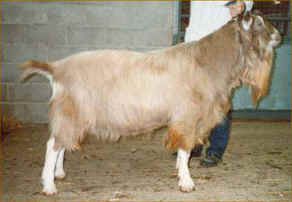 The British Toggenburg has acceptable variations in type and colour. These points are made by referring to the Breed Standards, the gallery of photographs and the photographs on this page. 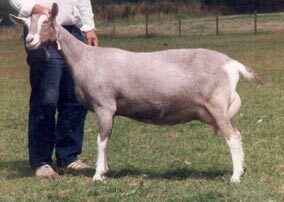 The females must carry white Swiss markings on the head, legs and around the tail and rear. The body colour varies through different shades of fawn and brown (to a chocolate colour). 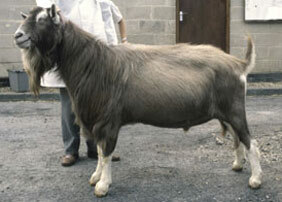 Reference to the historical development of the breed gives the reasons for this. All females should have dairy quality. Conformation of BT's is generally sound and they have excellent longevity. 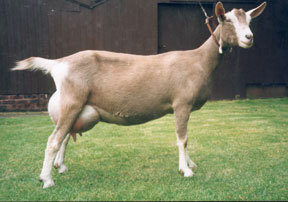 A feature of many BT's is their excellent udder development (see pictures above). Study of the data on this site (Milk Recording and Shows) indicates that BT's produce milk of good quality and quantity with a good length of lactation. Temperament is generally very good and they are easily managed. They are efficient feed converters and thrive on bulk fibre feeding regimes. The British Toggenburg Society attempted for many years to identify the best males by keeping records of their milking daughters, and circulating this information to its members. Adult males usually have longer and coarser coats than the female. Markings are similar, but the facial stripes can become less distinct as they get older. They should be sound with good width across the front and rear, have good feet and legs, standing four square. These points are shown below.